Thank you to the inspired writers and photographers who have shared the story of Slow Food! Media inquiries, please contact Becca Brown, Slow Food Vermont board co-chair, at slowfoodvt@gmail.com. In Slow Food communities, we talk a lot about the Ark of Taste – Slow Food’s catalog of delicious foods facing extinction. It was identified early in the history of Slow Food that biodiversity is essential to a healthy environment and to defending our future against climate change. 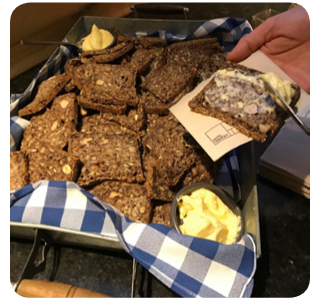 What excites me most about Slow Food is that in a world that feels more and more serious and fraught, this international organization chooses to celebrate all good, clean and fair food cultures around tables with friends, food, beverages, stories and joy. Treat followed treat at a Slow Food Vermont potluck dinner in Burlington in January, but it was the meal’s final dish that lingered in my memory. Throughout Vermont, a number of restaurants regularly incorporate local meats and produce on their menus, often sourced from mere miles away. Usually, an accompanying list of the partner farms will be listed on the menu as well. But what if a restaurant wants to add more credence to their claims? How could they prove to the increasingly educated and growing locavore population that they are actually doing what they say? 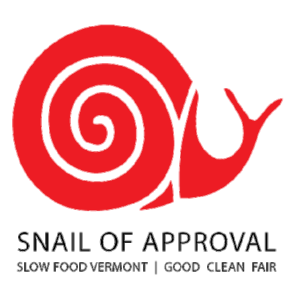 This is where Slow Food Vermont’s Snail of Approval comes in.